It’s become a holiday tradition. Each year, in the weeks leading up to Christmas, countless towns and localities around the United States allow a Christmas nativity scene or crèche to be put on government property, often in front of a town hall or a courthouse. And each year, in at least a few of these places, people object to these displays – sometimes through legal action, arguing that the displays violate the Establishment Clause of the Constitution’s First Amendment. Already this year, controversies over the placement of nativity scenes have arisen in places like Portsmouth, Virginia; Baxter County, Arkansas; and Cherokee County, Texas. So far, officials in these and other places have not been forced to remove their crèches. A new Pew Research Center survey finds that most Americans favor allowing religious displays like nativity scenes to be placed on government property. 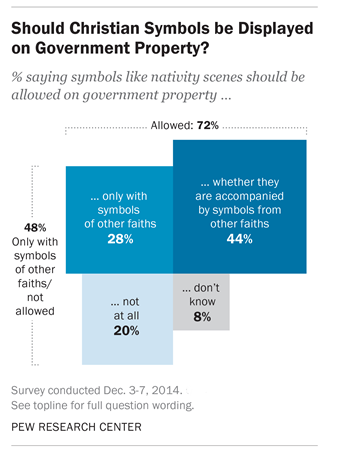 The survey found that 44% of U.S. adults say that Christian symbols should be allowed even if they are not accompanied by symbols from other faiths, such as Hanukkah menorahs, while another 28% say Christian symbols should be permitted as long as they are accompanied by symbols of other religions. 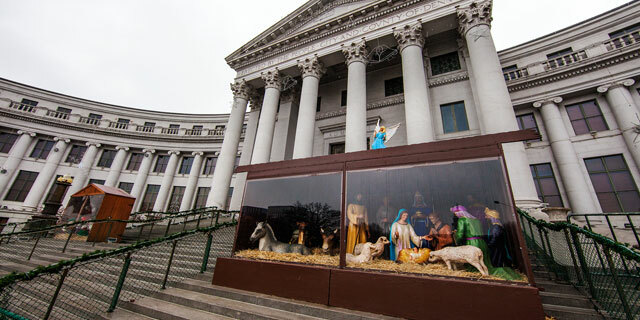 The Supreme Court has addressed the constitutionality of nativity scenes on public property on more than one occasion. In one case, Lynch v. Donnelly (1984), the court ruled that a nativity scene in a shopping district in Pawtucket, Rhode Island, did not promote or endorse Christianity and thus did not violate the Establishment Clause because the display also contained secular symbols of Christmas, such as a Santa Claus and reindeer. The Lynch decision spawned what has become known as the “reindeer rule,” an assumption that a religious nativity scene can survive a court challenge as long as it is part of larger holiday display that contains secular holiday symbols or symbols from other religious traditions. Since then, the Supreme Court has not addressed the issue. But lower courts have considered the details of many cases, and have come to different decisions based on many factors, including the precise location and content of a display and the religious diversity of a community. Recently, perhaps in response to legal precedent, some public spaces have been opened during the holidays to nontraditional groups, making for strange bedfellows. This year, for instance, the rotunda of the Florida state capitol is expected to house a number of displays, including two nativity scenes and a diorama depicting an angel being cast into hell. The diorama is sponsored by the Satanic Temple, which threatened to sue the state after Florida officials rejected the group’s proposed display last year as “grossly offensive.” This year, it was approved, along with a Festivus pole (from a made-up holiday on “Seinfeld”) and a display dedicated to the Flying Spaghetti Monster.